We are The Actor-and-Puppet Theatre ‘Gong’. We have 10 performances both for children and adults in our repertoire. Both children and adults watched with enthusiasm such productions as: “Two Maples”, “The Wizard of Oz”, “Peppy”, “Tramps of the North”. We played to capacity the productions for adults: “A Little Fool”, “A Dream”, “A Pie with Muster”, “A Tsar’s Folk Comedy”, “The Lizard”, “Angela and the Wind”, “The Scarlet Sails”. The performances are always interesting, innovative, unusual in form and deep in meeting. 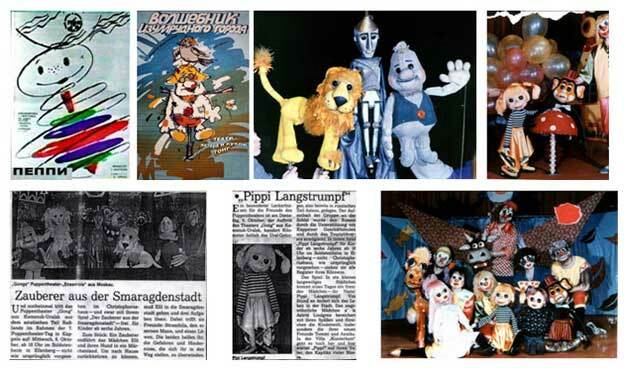 We received positive feedback from spectators in Ural region, Siberia, Kazachstan and Germany where ‘Gong’ took part in puppet theatre festivals. German newspapers carried among others the headline that ‘Gong’ “bewitched the kids”. Performing plays (puppet and purely dramatic ones) which deal with eternal human problems the theatre has managed to enter the hearts of sensitive viewers and those who like to and can mentally develop the author’s message as do it music listeners. After a forced time-out the theatre produced a performance ‘Home’ for adults. Puppets don’t speak in it. Due to it the language barrier is absent. ‘Home’ has an international message. Puppets are as easy as to understand as music, dance or pantomime. Viewers of any color, nationality and religion laugh and cry equally in the hall. Our puppets carry the idea of brotherhood. The performance includes 15 stories; each of them is a finisned work. They are like beads strung together on a single thread and present a variety of genres, styles and music. The dominating style is ‘black cabinet’. ‘Home’ is a philosophic notion. An apple is home for a worm, home is a city, the earth, the universe and different things happen there: politics, religion, war, peace, music… Names of stories can provide insight into the performance: an Archaeologist, a Match, the Choir, the Obstinate, the Dragon, the Cello, Marionettes, the Monument, Gods, ab Ahgel…The performance lasts 70 minutes. We assemble stage scenery without using a single nail in 1.5 hours’ time. The power of dimmers is 24 kW; there is just a ‘gun’ in the hall. Puppets are large. Spectators feel comfortable – they can see and hear everything. The tantamaresques, the flatbed and upper-cane puppets, the marionettes, the masks and the actors in flesh – all go together in our ‘Home’ making viewers happy and warming their hearts. The photo session is just a small part of a big lively performance, but even this smallness conveys its spirit and message. the director of The Actor-and-Puppet Theatre ‘Gong’ Takhir Ibatulin.